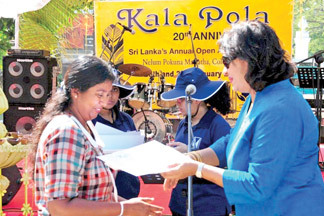 Kala Pola , Colombo’s annual open-air art fair, celebrated its 20th anniversary in a riot of colour and camaraderie recently. Gracing the inauguration ceremony were Ambassador for France in Sri Lanka and the Maldives Christine Robichon, Director of SAARC Cultural Centre G L W Samarasinghe, Deputy Chairman of John Keells Holdings PLC Ajit Gunawardene, Chairman and Trustees of The George Keyt Foundation, and a large number of well wishers and invitees. Kala Pola 2013 hosted a record number of 345 artists and sculptors, who, in turn, attracted nearly 30,000 visitors over the weekend along the sidewalks of Nelum Pokuna Mawatha, Colombo 7. As part of the 20th Anniversary features, Kala Pola 2013 also included an Art Auction, a Public Lecture series on Art and a Children’s Art Corner (each attracting over 120 art enthusiasts) and an exhibition of works from SAARC countries. A significant feature this year was the participation of differently-abled children whose work was greatly appreciated by one and all. Cinnamon Lakeside Colombo hosted a café stall modelled on the hotel’s façade and decorated with artistic masterpieces from Europe under the theme `Medieval Art and Modern Food’. Saturday night entertainment included lively performances by Thriloka and Ravibandhu’s drummers. In a much appreciated show of solidarity, several private art galleries in Colombo joined hands and presented their own art exhibitions, thus extending the spirit of Kala Pola . These ‘fringe events’ around Kala Pola added value to tourists and visitors and created an ‘art ambience’ in Colombo. “The core objective of The George Keyt Foundation has been enabling ‘Opportunity for Art’, especially for aspiring artists,” said The George Keyt Foundation Chairman Cedric De Silva. “ Kala Pola 2013 attracted a record number of 345 registered painters and sculptors from various parts of the country, providing the artists and the art-loving public an enabling forum to appreciate and exchange works of art. The two-day event is estimated to have generated over Rs seven million in sales, excluding what was commissioned by potential buyers. Hats off to John Keells Holdings and the John Keells Foundation for its commitment to the artists and the art-loving public of Sri Lanka for over 20 years!”. Echoing these sentiments, John Keells Holdings’ Head of CSR Nadija Tambiah said, “We are delighted with the resounding success of Kala Pola . Yes, it was certainly a grand show with a range of ancillary events and an unending visitor turnout during both days. Breaking with tradition we transformed Kala Pola into a night art market on Saturday and this too was greatly appreciated. A major tourist attraction, the Kala Pola brand is now unmistakable and inescapable, and, has undoubtedly grown into one of Colombo’s iconic landmarks”. To commemorate Kala Pola’s 20th anniversary, certificates of appreciation and rosettes were presented to 50 long standing participants.